Most faults arise because the level has dropped through evaporation or leakage (See Checking the gearbox oil level, draining and refilling), or because the engine tickover speed was incorrect when you checked the level. Keep the fluid level up to the full mark on the dipstick. Do not overfill this can lead to overheating. The sump and the ventilating grilles on the torque-converter housing can easily become blocked or mud covered, and this leads to overheating. Check and clean them at each service. Let the engine run for two minutes with the selector at park 'P'. The transmission fluid level is best checked when the engine is at normal running temperature. After a 5 mile run, park on level ground and apply the handbrake. With the engine idling, move the gear selector lever at least three times through all positions. Set it in the 'P' (park) position and let the engine idle for two minutes. Clean around the dipstick area to avoid dirt getting into the transmission. Before removing the dipstick, wipe round it with a clean cloth to stop dirt entering the gearbox. With the engine idling, remove the dipstick and wipe it with a clean, non-fluffy cloth. Replace it gently, so as not to force fluid back up the dipstick tube and so give a false reading. Withdraw it immediately and check the level. Check the fluid on the dipstick for specks of dirt or metal — both indicate wear. If there are any, get expert advice as soon as possible, before the repair becomes very expensive. On older cars particularly, check the fluid colour against the colour of new fluid. If a red fluid has darkened or turned black, it indicates overheating and the fluid should be changed. Top up the fluid levels through the dipstick tube, using a small funnel. Add a little at a time and check the level frequently to avoid overfilling. The difference between the low and full marks on most transmission dipsticks is about 1/2 litre (about 1 pint). So if the reading is midway between them, about litre pint) is needed. If you top up the fluid level while the engine is cold, fill to 1/2 in. (13 mm) below the dipstick full mark. Otherwise it will be too high at normal running temperature and will cause overheating. Check the level again at normal running temperature. Some car handbooks recommend draining and refilling automatic gearboxes at certain fixed mileages. However, most automatics fitted to recent and current cars do not need regular draining, and do not have a drain plug. Draining them is a quite difficult and messy job, necessitating removal of the dipstick tube and gearbox sump pan, a task calling for scrupulously clean working conditions and garage facilities. Follow the maker's advice in the car handbook or a service manual. The smaller automatic gearboxes do have drain plugs, and the fluid must be changed at the intervals recommended in the car handbook. Those fitted to BL cars, which use the same oil as the engine, receive fresh oil when the engine oil is changed. Others, such as those fitted to some VWs and Renaults, have their own separate fluid supply. 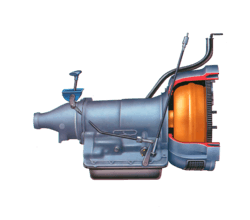 The transmission should be drained while the fluid is at normal running temperature. Take care: it will be hot enough to cause serious burns. In most cases, draining must be done with the car raised and supported securely on axle stands or ramps and with the handbrake on. 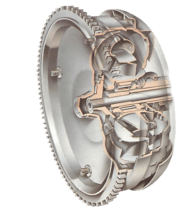 An automatic transmission that requires regular draining and refilling should be drained with the unit at running temperature. Remove the drain plug carefully, keeping hands and arms clear of the hot fluid, which can burn. Place the drain tray under the sump, and undo the plug, keeping your hands and arms clear of the hot oil when it gushes out. When all the oil has been drained, replace the drain plug and refill with fresh fluid or oil of the type recommended by the car handbook or service manual. Refill with the quantity recommended, and drive the car until the new fluid is at normal operating temperature, then check the level again and top up if necessary. Do not pour the old fluid down a drain — it pollutes the water supply. Ask your local council for the location of the nearest oil disposal dump and take it there. 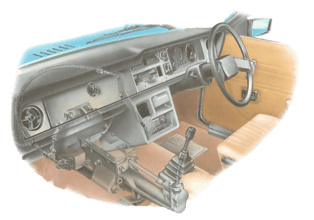 The old Renault automatic transmission has a separate fluid supply. Automatics on some old cars share the lubricant supply with the engine and have a common sump. Cars fitted with modern automatic gearboxes must not be towed for a distance of more than about 15 miles. The towing speed must also be kept under 30 mph (50 kph). The reason for these restrictions is that the internal fluid pump of the gearbox, being driven by the engine, does not work when the engine is not running. When the car is being towed, therefore, the box is not lubricated or cooled. If the car has to be towed a greater distance than 15 miles — in the event of a breakdown, for example — raise the driven wheels or disconnect the propeller shaft or drive shafts (See How to check U-Joints). If the car is being towed by a garage or breakdown recovery service, make sure they are aware that the car has automatic transmission so that they do not tow it too far or too fast.